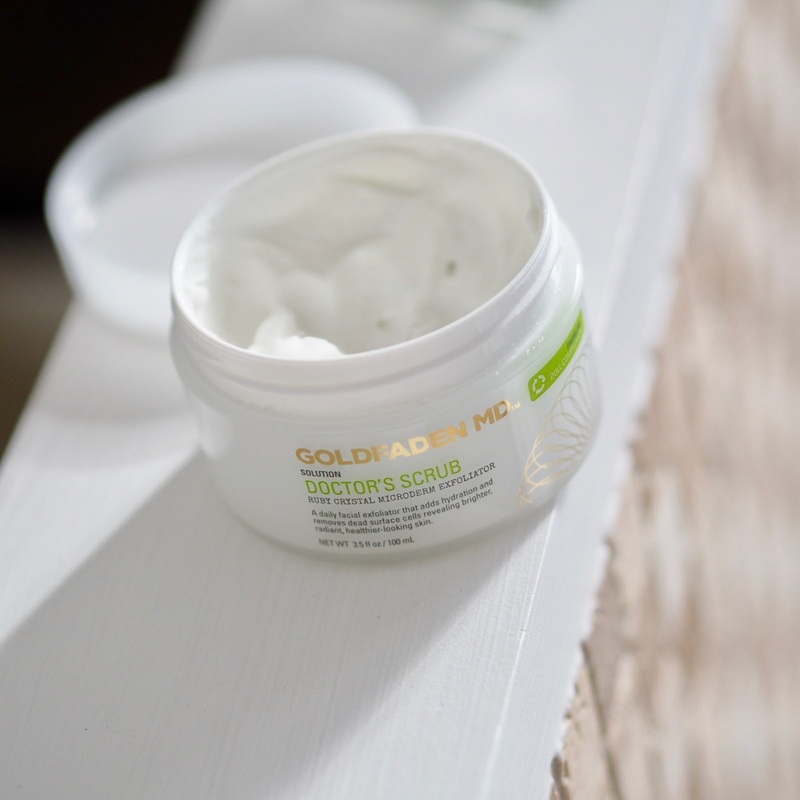 Earlier on this year I was sent a PR sample of the Goldfaden MD Doctor's Scrub to try and I'll hold my hand up and say that this was the first time I'd come across this brand and I was intrigued. After promptly opening the box and unscrewing the top, the first thing that I noticed was a gorgeous smell and I popped a bit on the back of my hand a rubbed it in. I couldn't get over how smooth it made that little patch on skin on my hand and could not wait to pop this onto my face! I love it when a product provides immediate results and the Goldfaden MD Doctor's Scrub certainly delivers. It gets rid of dead skin cells (yuck!) and visibly improves skin texture by using very fine ruby crystals and also contains seaweed extract and hyaluronic acid. I find it leaves my skin smooth but also hydrated and this is important with an exfoliator because more often than not they leave your skin feeling tight and irritated. Since receiving this product in the Summer I've been using this around twice a week and still have lots left. I can see this also being particularly useful in the Winter months too. 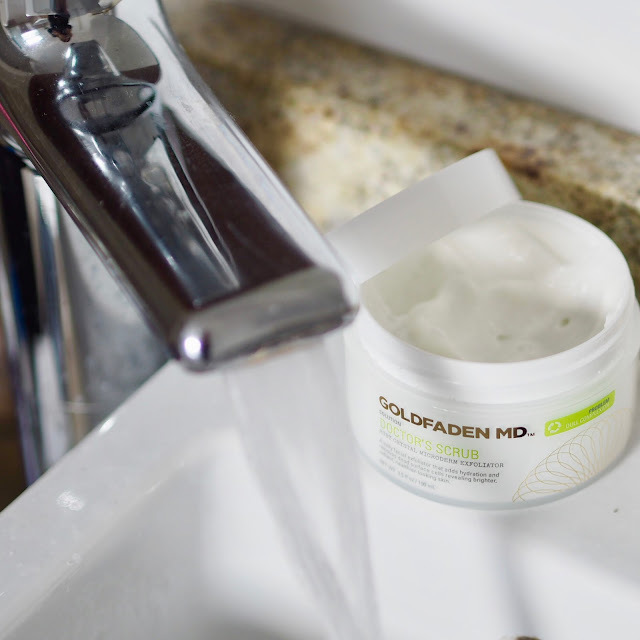 "A bit about Goldfaden MD..."
After being so impressed with the Doctor's Scrub, I was thrilled to get the chance to meet with one of the founders of the brand, Lisa, last month. She explained that they are a 'results focused' brand who are actually the first physician strength, dermatologist developed, natural skincare line in the industry. They use state-of-the-art technologies with active plant cells and antioxidant rich botanicals to develop products that target a range of specific skin concerns. I absolutely adore the concept of the brand and after meeting with Lisa it was apparent how passionate they are about their products, and rightly so! "Now for the best bit...."
The perfect gift to give someone (although if it were me, I'd be buying this for myself!!!) and it's suitable for all skin types, even very sensitive. It's also suitable for all age ranges. 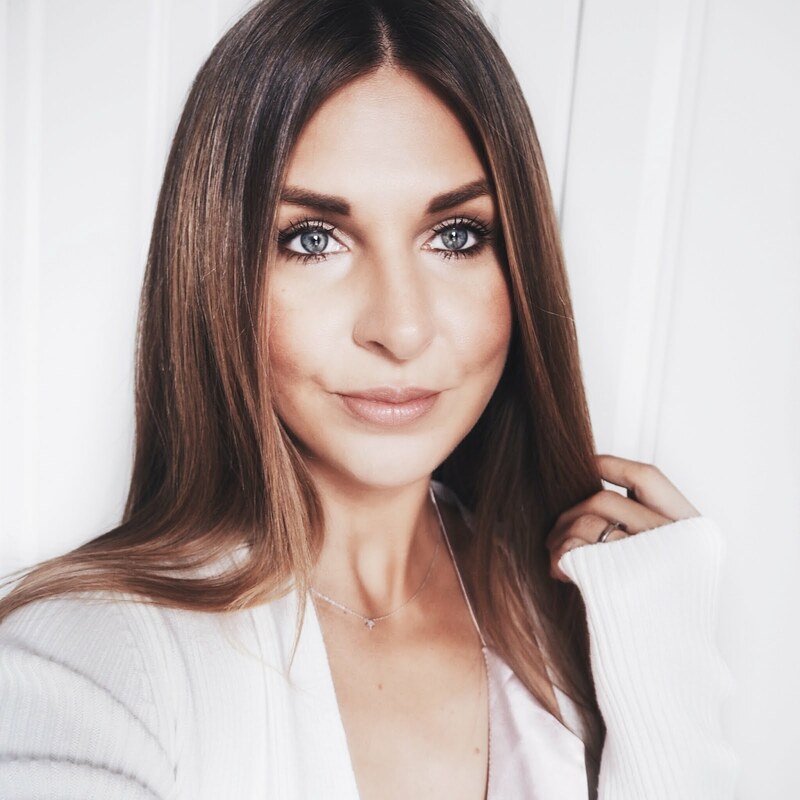 When used in conjunction with each other the kit reveals a healthy, glowing complexion and I can honestly say that it's transformed my spotty skin quite dramatically (coupled with the next sneak peak product I'm about to show you!) It's also a fantastic way to trial some of their best products for a fraction of the price. "A sneak peak...pop this on your January shopping list!" I couldn't introduce you to the Goldfaden brand and not include this product that will be available to buy in January 2017 because I've been bowled over with how great it is!! 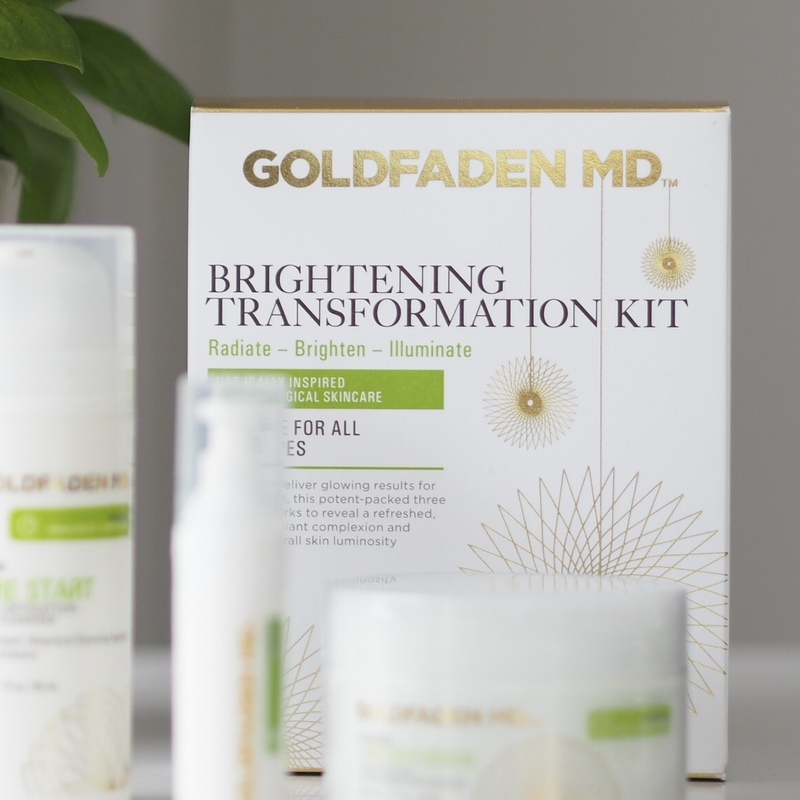 Every single product I've tried from the Goldfaden range in the past couple of months has been outstanding but this product couldn't have been given to me to trial at a better time. August and September were troublesome months for me skin wise, my face was plastered in large cystic acne style spots and I was getting really down about it. Since using the Goldfaden Facial Detox mask weekly, it's really made a huge difference to my skin (which is now clear - thank god!!!). The product treats affected areas, heals the skin and then also prevents from future breakouts. I think the Brightening Transformation Kit would make a great Christmas present for someone or if you're looking to try some of the products without breaking the bank (especially at this time of year!) it's a good way of doing it!